Reading your meter can help you better understand your water usage. 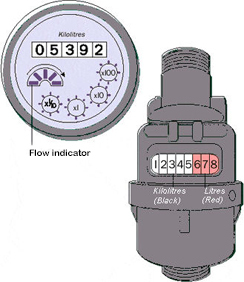 You should read your meter at regular intervals to monitor water usage. As meters age they often slow down. By reading your meter over time you may be able to spot a change. When a new and more accurate meter is installed, we recommend you read the meter each month. This way you will not be surprised by a higher than usual water account. Meters installed after 2000 have a number of dials for operational purposes. The row of black numbers show the kilolitres of water used by your home. The row of red numbers on barrel meters show the litres used. A dripping or leaky tap is not only annoying but it can waste a lot of water as well. One drop per second equals 7,000 litres of water wasted per year. In the table below you can see how much a water is lost from a dripping tap. The average home uses 63 buckets a day. Never leave the tap running while you shave. Never wash your dishes using a running tap.